I've always wanted to experience the Winter Blast Pyrotechnics Show in Lake Havasu. This year I got my wish. Parked on the hill directly across from S.A.R.A. Park, where everything was happening. Saturday had this great band. Even had an opportunity for a little dancing. We were enjoying the show. Four evenings of fireworks. What more could you ask for. This was taken through the windshield of the RV. We were sitting high enough, I could sit in the passenger seat and view the display. Sometimes I did go out and sit around the fire, but I had a bit of the stomach bug and spent most of the time inside. But I still got to see the fireworks. 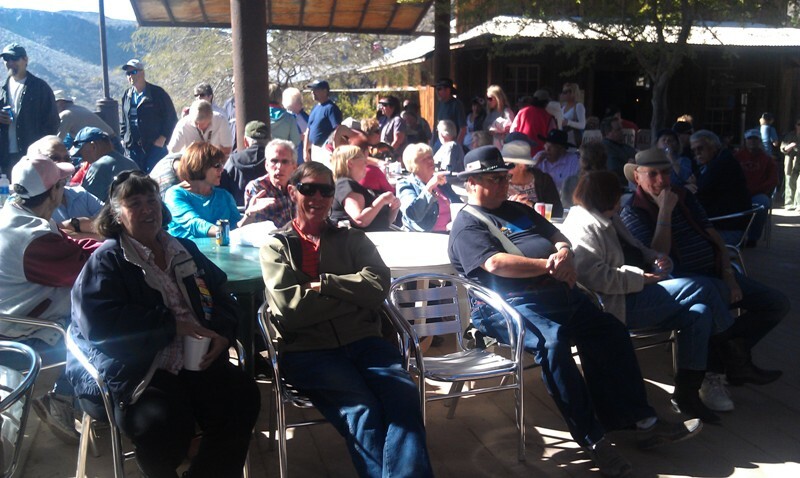 For those who have wondered where I've been, I chose to spend the winter in Mesa, AZ, in the Silver Spur RV Park. This was after my RV had some remodeling done by D&R Family RV in Glendale, AZ (see my previous blog). So, since Dec. 1, I have been sitting in a park in Mesa. Then in the middle of December, my son, Sam, decided he needed a change and moved out here. He has been livjng with me until he gets settled and gets his own place. So until the end of March, I plan on staying right here, except for a few side trips, like Quartzsite. I only went over to Quartzsite for a few days, mainly to see what was new at the Big Tent. But while I was there some of us drove out to the Desert Bar for some dancing. 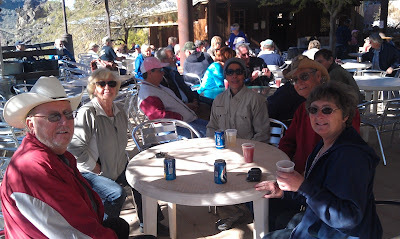 Then the following day, several of us drove the back road into the Desert Bar (even though it wasn't open that day). We got there almost an hour early and it wasn't too crowded. By the time it officially opened, the place was packed with standing room only. 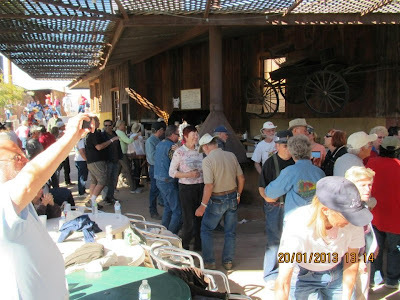 I go out to the Desert Bar every year I attend Quartzsite, so read back through my previous blogs (always in January) for 2009, 2010, and 2011 for more about Quartzsite. 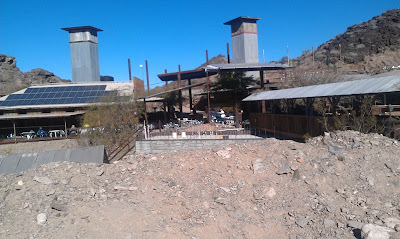 Here is where we started the 4-wheel drive, going in the back way to Desert Bar. It was being planned for a venture the following weekend, but the leader wanted to check out the roads before. So several of us joined Mel for the trip. It never looks as bad in the picture as it is in person, but this hill, right at the beginning of the 4-wheel road, was steep and rocky. Here, Tom is sliding and skidding over the rocks and loose dirt. Max actually had to put his jeep in 4-wheel to make it up the hill. Another steep hill to climb. Every year the road is different based on the rains and how badly the road has washed out. Since this is an unmaintained road, you never know how bad it's going to be. Tom had a flat tire. Those sharp rocks really got to this tire. Tom could stick his finger into the cut on his tire. 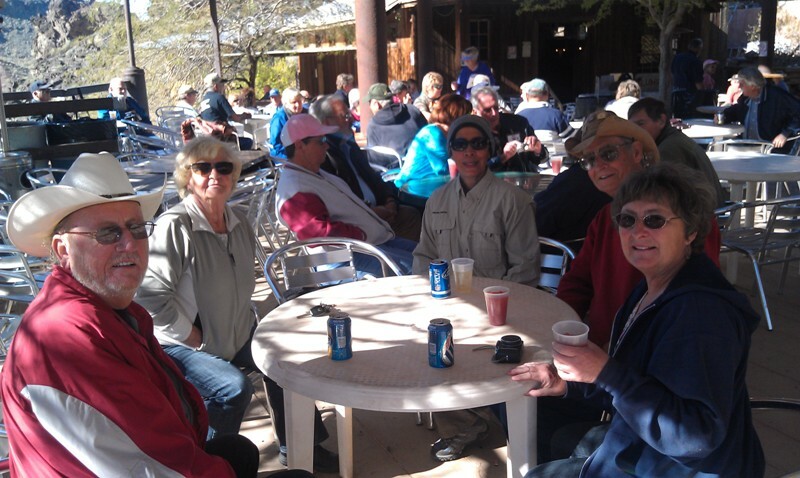 After some miles and several hours, here we are at the Desert Bar. Just one more steep wash to go through. Mel chose to go an alternate route, but Max and Tom went for the ride. I was beginning to think I was on a roller coaster ride. But there it is, the back side of the Desert Bar. Deserted and shut down since it was Monday. In fact, we parked the cars and walked up the the bar, but someone came out and told us to leave, we were trespassing. My next few days were spent browsing the goods for sale at the Big Tent. La Mesa RV serves a free breakfast of pancakes every morning and a free lunch. So we had breakfast one morning and lunch several times while we were in town. On Friday nite, several of us went to the Grubsteak for fish. But it had changed owners and the service was terrible. Fish was ok, but heavily breaded. We got seated after about a 30 minute wait, but it was another 45 minutes before they took our order and another hour before we got our food. Don't think I'll be going back there soon. And of course I had to eat at Silly Al's Pizza (love their salad made with all the pizza toppings) and go dancing at the Yacht Club. Got to visit with lots of friends I hadn't seen in about 2 years because I was on the east coast in 2012. But then I had to return to Mesa; appointments were waiting.